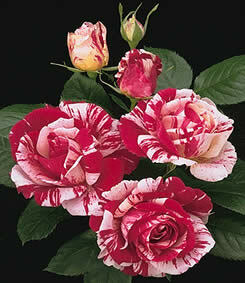 Floribunda - Burgundy-red swirled with creamy white. You might think stripes are a new-fangled thing. But it is the old rose heritage that brings the genetic stripping to this spicy scented new-comer. Each petal is as unique as a snowflake--some more burgundy-splashed-white, some creamed-swirled-red-all on the same vigorous plant. The old-fashioned form & fragrance may remind you of its stingy blooming ancestors. Yet the nearly continuous number of blossoms lets you know there's modern kinfolk in there, too. Distinctive clean quilted foliage. Comments: Best color & size in moderate temps. Perfect for potpourri. 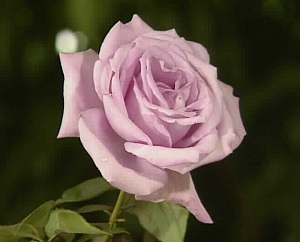 Withstands temperatures as low as minus 10 degrees F.
More lilac-purple than blue, it is still an unusual colour for a rose. 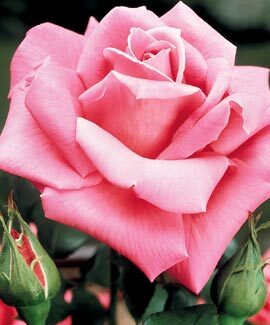 Blue Moon is a Hybrid Tea rose or, as the Royal Horticultural Society prefers to call it, a large-flowered bush rose. The flowers of this variety are certainly large, with an unfortunate tendency (shared by many HT roses) to open into big purple blobs resembling loose cabbages. Beautifully pointy in bud though. Blue Moon has an unusual scent to match the colour. I've seen it described as "a lemon scent", but I must say I disagree. It's a difficult scent to describe — maybe a bit like bubble gum. With their optimistic hue and general association with good cheer, yellow roses are the perfect way to toast friends, lift spirits and send a general wish for well-being. And that’s great news for those who love roses—the rose is known for its simple, architectural beauty, but some colors are so loaded with significance that they can be a bit tricky to work with. Sending a get-well bouquet of red roses to your administrative assistant might raise eyebrows around the office, for instance. 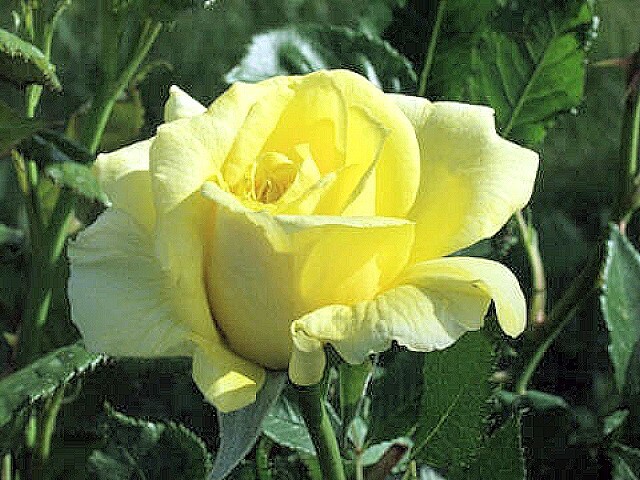 Suffice it to say, you can never go wrong with yellow roses. Thorn-less Rose "Love at first sight"
Two roses entwined together communicate "Marry me"
* These roses do not actually exist in nature. They are created artificially.